San Francisco: Kia is one of those car companies that is under appreciated. Whenever someone thinks Kia, they envision inexpensive cars for the income limited or cost conscious. Too bad, because Kia builds some darn fine vehicles. A case in point is the Sorento, Kia’s “truck” based SUV. The Sorento can be directly compared to the very few other vehicles. Most of the SUVs in this class are based on a front-wheel-drive platform. The Sorento is a front-engine, rear-wheel-drive based platform, with a two-speed Hi / Lo Range transfer case with part-time 4WD available. For 2007 the engine was increased to a DOHC, 3.8-liter, 262 hp V6 and is mated to a 5-speed automatic transmission. A 5-speed manual was offered in previous years but it did not garner enough buyers to warrant its inclusion in 2007. The Sorento is a 5-passenger vehicle that has ample cargo space for those five. It is 180.7” long and has 31.7 cubic feet of storage with the rear seat in use. Fold the rear seat down and you are ready for some serious hauling. But one area that the Sorento does fall short of is in third row rear seating. Many SUVs of this size now have a third row of seats; the Sorento does not. Never mind that for many the third row seating is near useless because of the difficulty getting in or out of it, but a third row seat is a prominent sales feature in this class. What the Sorento has in spades though is safety. The Sorento earned the highest possible safety rating from the Federal Government, a 5-star rating for all seating positions in frontal and side impacts. If safety is a big concern for you, and it should be, you need to take the safety ratings seriously. But remember, the most important safety device on any vehicle is you, the safer driver. The Sorento comes in three versions, Base, LX, and EX. The Base is available only in two (rear)-wheel-drive; the LX and EX are both available either as 2WD or 4WD. The Base 2WD version is fairly well outfitted. It comes with alloy wheels, premium sound system, power locks, ABS, electronic stability control, traction control, and a tire pressure monitoring system. 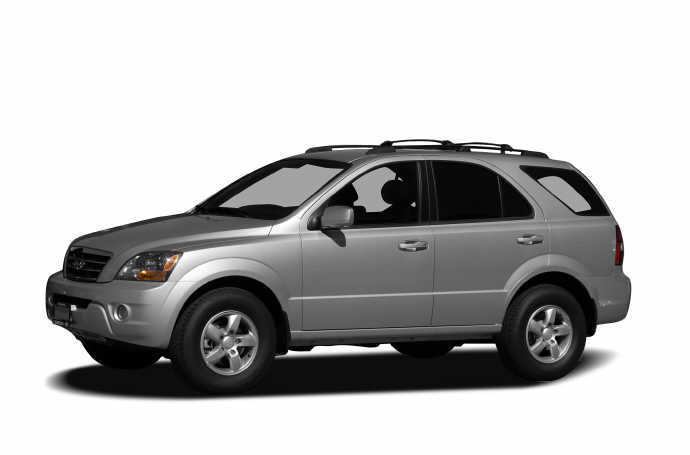 The easiest way to determine what a Sorento outfitted your way might cost is to go to www.kia.com and “build” your own. None of this tells you how it drives. The first thing you notice when you get into the Sorento is that it is smaller than it looks. By this I don’t mean that it feels cramped inside, it is really roomy. What I mean is that it is very maneuverable, it fits in spots you wouldn’t believe possible. The Sorento has “presence” on the road; it looks muscular, and hefty. It is hefty, weighing in at a maximum of 4,646 pounds, which is a blessing and a bane. The heft means gusts of wind or trucks passing don’t buffet it around, but it also hurts fuel economy and performance. The mileage ratings are 17/22 for the 4WD and 17/23 for the 2WD. I came close on my mixed commute, which is primarily highway, averaging about 18-mpg. The engine is smooth and willing, and the transmission worked fine. I wish there was a manual transmission option but I don’t always get my wishes. I drive each vehicle for about a week. There was no downside to the Sorento. It was comfortable, easy to drive, stable, everything you want in a SUV. I wish I had needed to test its off-road or its towing capabilities, but like most SUV buyers all I did was commute, just me, the Sorento, and the highway. The EX Sorento I drove was well equipped, well laid out, and comfortable. This is a vehicle that is made for real-sized people, which is something I appreciate. Speaking of towing, the Sorento will tow up to 5,000 lbs., which is a decent sized trailer, plus it has a load capacity of a half-ton. Meaning you and your he-man buddies can go on that fishing trip and still pull the boat along too.